There’s no use ignoring the fact that we’re all pretty much pumped about Grindhouse finally getting into movie theaters this weekend. The Quentin Tarantino & Robert Rodriguez collaboration has us tingly all over & it’s not even lunchtime. 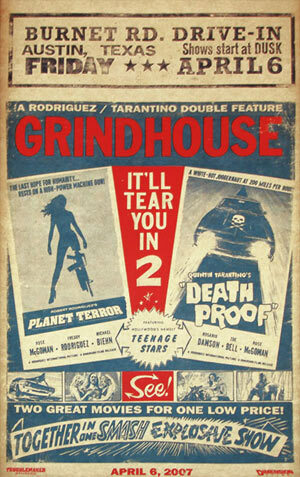 Grindhouse will release a double feature on screens this weekend, Rodriguez’s Planet Terror starring Rose McGowan & Tarantino’s Death Proof that sees Kurt Russell take the lead. All in all, we’re damn excited about these thriller releases & all agree that the weekend could not get here any faster. Also in theaters this weekend, Are We Done Yet?, the new Ice Cube movie that sees the actor move out of the city with his family & into a fixer-upper home in the suburbs. Yeah, go ahead & skip this one, don’t ya think? A new family film, Firehouse Dog, also sees its theater debut this weekend. Rex, a Hollywood canine, gets lost in a movie stunt scene & is adopted as a mascot for a local fire station. Sounds like this has family written all over it, in dog poo that is. Hilary Swank’s The Reaping will be sharing the screens as well. Swank, who stars as a religious myth-buster, gets the surprise of her life in a small Louisiana town. I’ll leave this one up to you to decide. So, Grindhouse it is & The Reaping a maybe. Either way, we’re in for one hell of a weekend, eh?